ColourVUE contact lenses offer you the opportunity to give your eyes a makeover at any given time. Enhance your natural look or opt for a complete change of eye colour. 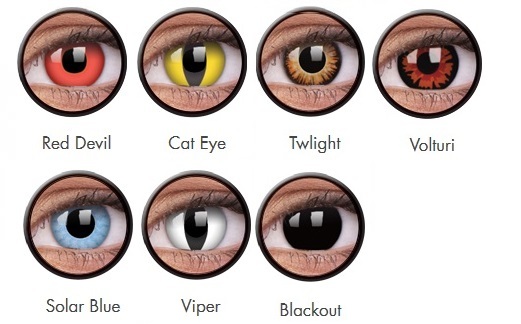 The lenses are the perfect finishing touch for any costume – featuring lenses based on movie characters as well as a large variety of other exciting designs. Lenses are TGA approved and are renowned for being very comfortable to wear courtesy of Hydrogel technology which allows high oxygen permeability. The unique three layer colour sandwiching method prevents the colours coming into contact with the eye, ensuring wearing the product to be safe and durable. These contact lenses are made to last and can be used as many times as you want for three months from the time that you open them.